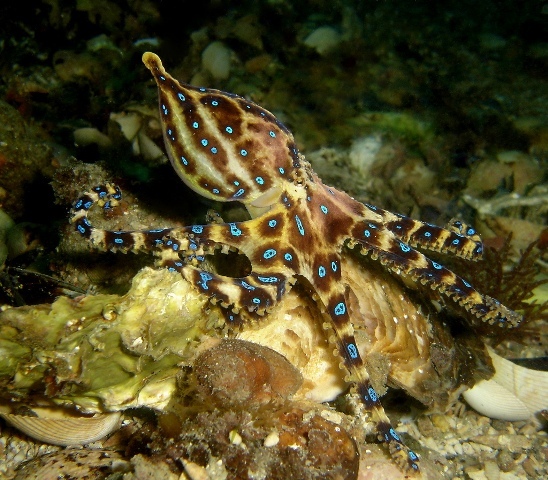 Blue ringed octopus is a small very dangerous creature. It is small enough to fit in an empty sea shell on the ocean bottom where it likes to hide. It is rather shy and doesn't bother you unless you pick it up or step on it. But if it does bother, it has the poison to kill 26 people in one go. It is found in all the waters around Australia, including Cape York. A good reason to wear rubber boots when out on the reef, and to be careful with what to pick up when playing on tidal rock pools. Children are at a higher risk because of their small body size. The animal is known for its blue rings, that are actually brown unless the animal is just about to poison someone. This animal comes in two different species, which together cover all the coasts of Australia. 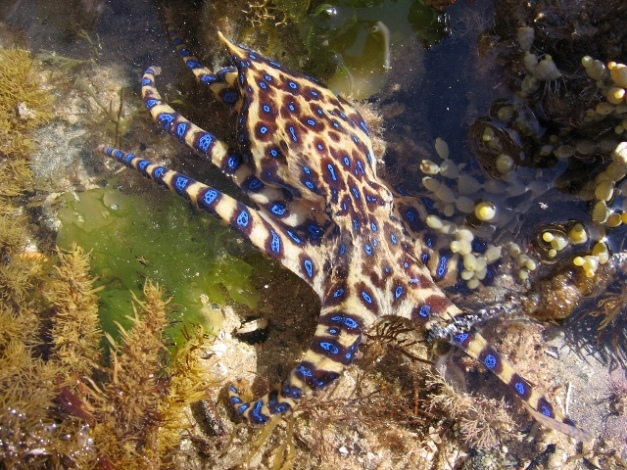 Down south there is the Lesser, or Southern Blue Ringed Octopus (Hapalochlaena maculosa), and up north we have the tropical Greater Blue Ringed Octopus (Hapalochlaena lunulata). While the southern species is only found in Australian waters, the northern species is found along the coasts of northern Australia as well as Papua New Guinea, Solomon Islands, Indonesia and Philippines. The animal is not often seen because it likes to hide on the sea bottom - in tidal rock pools and coral reefs. They hide in empty sea shells, clumps of algae and rock crevices. 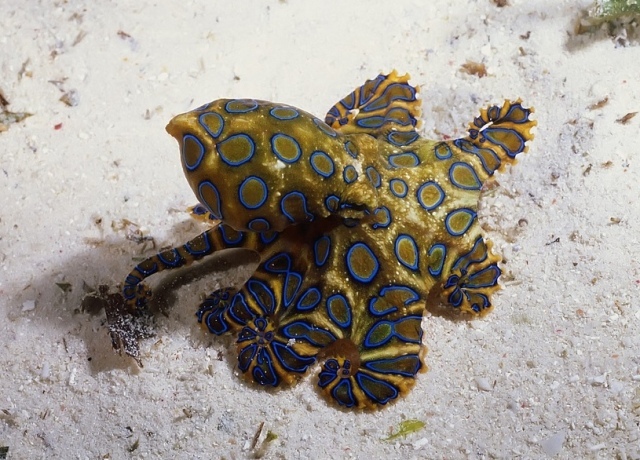 Greater blue ringed octopus is about the size of a golf ball. Like other octopuses, it has eight arms. Its body colour is beige, much the same as the sand that surrounds it. On the sandy-coloured background, it has darker, brownish rings on its body. Those only go blue if the animal is agitated. Unless the rings are blue, the animal is well comouflaged and not always easy to see on the ocean bottom. Their biggest favourite is crabs, but they also eat shrimp and other crustaceans, as well as small reef fish. They hunt during the day, and they are ambush predators, which means that they sit in the same place and wait for the prey to come to them, rather than the other way around. They usually only emerge from their hiding spots to hunt or mate. They are not aggressive and only bite if threatened or agitated. This most often happens when they are picked up or accidentally stepped on. 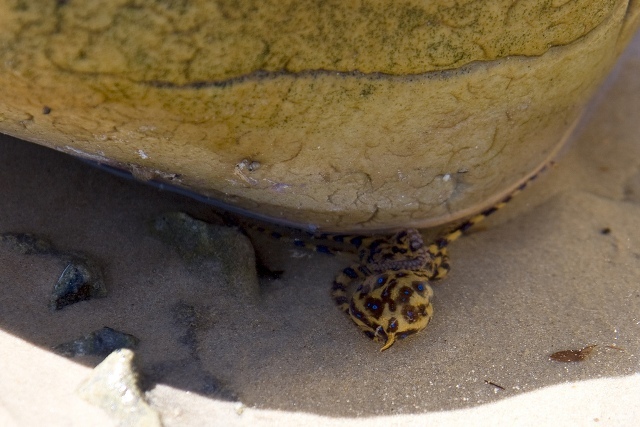 Watch what your kids are picking up when playing in rock pools. It is not only cone shells that can be dangerous to pick up. 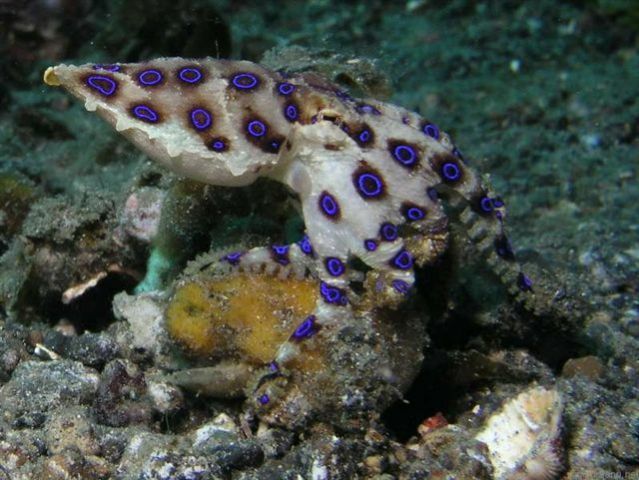 In some other shells, there may be a blue ringed octopus. Its bite is very small and can be painless. Some people don't even notice it before the symptoms start showing. Its venom is tetrodotoxin - a kind of powerful neurotoxin, which is produced in the animal's salivary glands. Tetrodotoxin causes nausea, numbness, weakness and severe or even total paralysis. The victim will notice breathing difficulties which can be followed by respiratory arrest. That will lead to cardiac arrest due to lacking oxygen in the brain, and can happen within minutes if not treated. A paralysed victim cannot breathe, move or respond, but remains conscious and can hear. * apply pressure immobilisation bandage, in a similar way to snake bite. Every smart Australian has one in their first hand kit in their vehicle (particularly on a Cape York trip!). * breathing difficulties that start within minutes have to be helped by rescue breathing until the ambulance arrives. Once the ambulance arrives the victim needs to be hospitalised for artificial respiration. 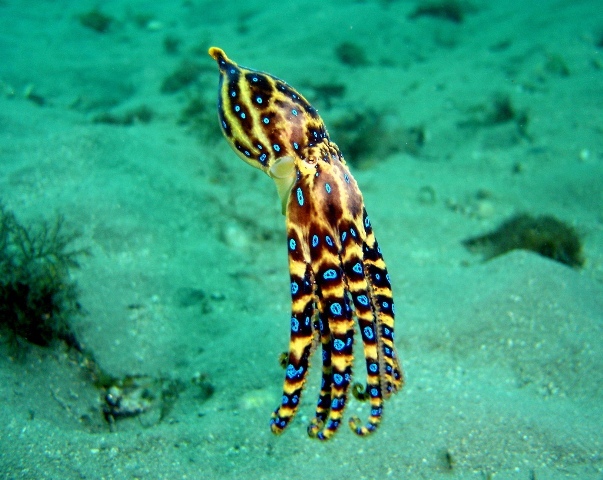 There is no antivenin for treatment of the poison of blue ringed octopus. The victim's body will actually, finally, get rid of this poison, but during the first 24 hours (at least) it needs respiratory support. Once the poison is metabolised and the paralysis subsides the victim will regain the ability to breathe. There have been two reported fatalities in Australia from this poisonous creature.